We are happy that our stock tank pool blog post from last year is performing so well! And the video is performing even better. Since this is our third season using the pool, we have been asked many of the same questions over and over again. 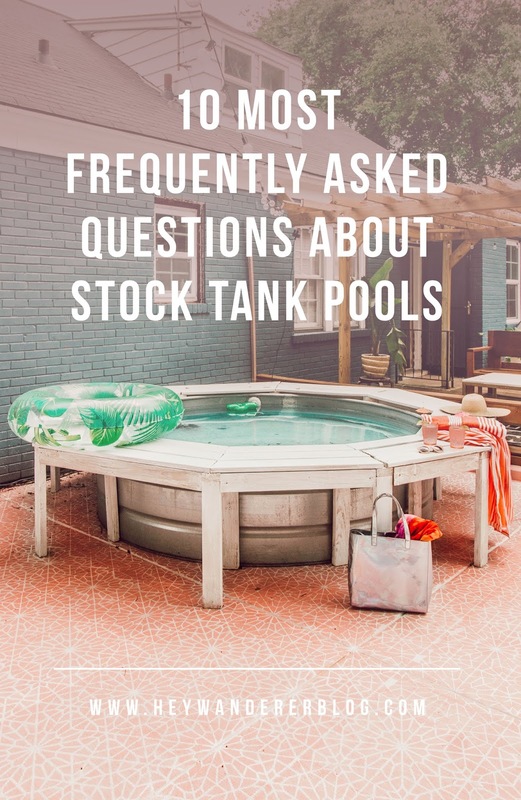 We decided we would compile a list of all our answers so they'd be easily accessible by you who are considering making a stock tank pool of your own. It is important to note that we are not stock tank pool experts. We've only set up ours, so we can only speak to our personal experience. 1. Can I use a pool liner? I'm not sure if they make pool liners to fit perfectly inside stock tank pools. My guess is probably no, but you could make another liner work. Keep in mind that stock tanks weren't originally designed to be pools, so there isn't much out there in the pool world specifically for them. Also, a pool liner is definitely not the look we were going for, so we don't use thus we don't have any experience with them. 2. Why don't you just get an above ground pool? That is what we first considered but we really don't like the look of above ground pools. 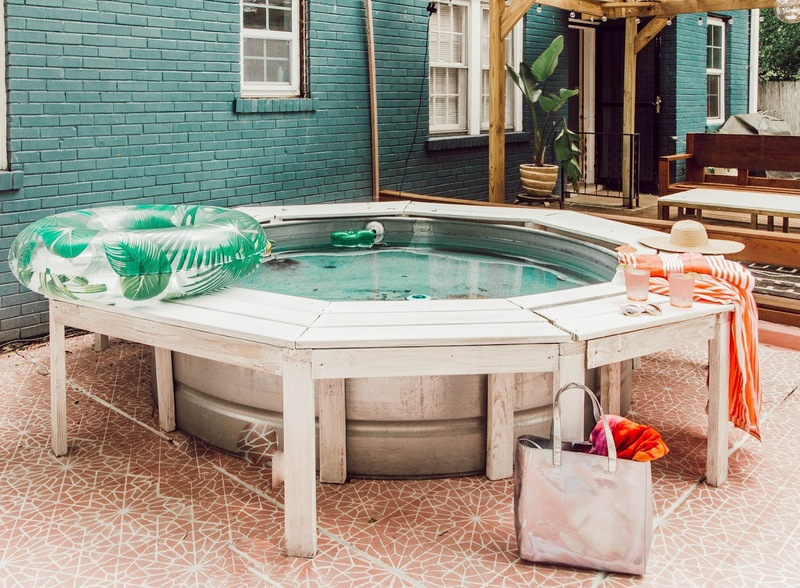 We could actually get a bigger pool for less money than the stock tank pool, but ultimately we love the look of the stock tank. It's perfect for what we need- all we really want is to be able to dip in and cool off. Also, our pool already exists so we won't be going back in time and using an above ground pool. 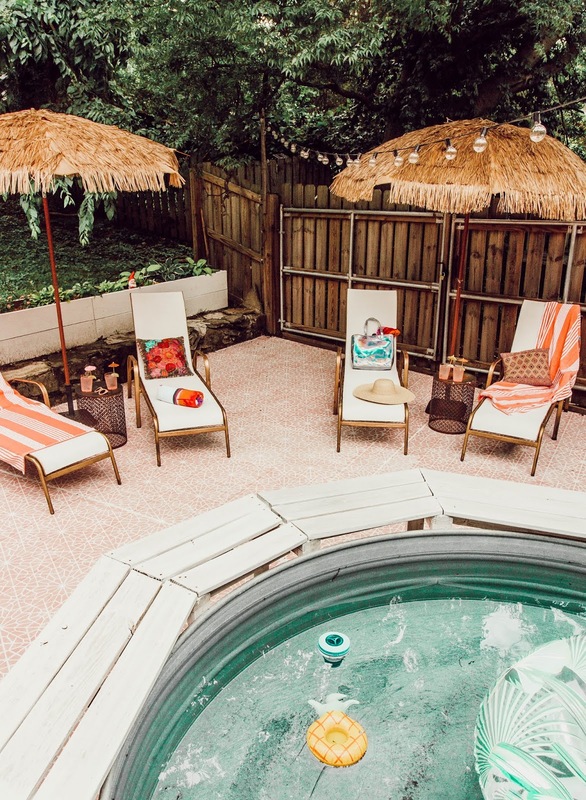 If you don't mind the bright blue color and the size of the above ground pool, maybe that choice would be better for you. I will say that we read that above ground pools usually last about three years, but a stock tank can last well over 10 if you take care of it. Again, I'm no expert so I can't say any of this for sure. These are just the reasons behind our choice! 3. Can you make it a hot tub? Possibly. We've explored this option but haven't been able to find a way to heat this properly and efficiently. We also aren't sure we want to turn it into a hot tub. We enjoy the break from maintaining the pool during the winter. We may try to do it this fall, but by the time summer is coming to an end, we really are ready to drain the pool. We will be sure to update this if we do try it and succeed! 4. Will chlorine cause rust? Eventually yes. We actually have rust for the first time on our pool this season. We are exploring our options for how to fix this and will update this with our solution when we do it. Plenty of people have commented and told us that chlorine will cause rust and we shouldn't use it. The truth is the stock tank will rust with time even with regular water with no chemicals or salt in it. The goal is to catch it in the beginning and fix the problem before it spreads. Like I said, we haven't had any rust problems until this year and we aren't worried about it. 5. How long will this last? There is no definite answer to this. I've read about people using theirs for 10+ years and we are on year 3. 6. Why don't you make it a saltwater pool? We considered this but after researching this, we ultimately decided to use chlorine. Salt water will cause rust as well. But you could certainly make this a saltwater pool if you wanted to. Chlorine was just the best choice for us. 7. Why don't you get a poly pool? Much like the answer to #2. We really don't like the look of the poly pools. They are about half the price but they look like large kiddie pools. 8. How much did this cost? The stock tank was around $350 and the pump was another $100. There were a few other parts so I'd say around $500-$600. 9. Where did you buy it? We purchased ours from our local Co-Op. 10. How big is it? How many adults fit in at one time? Ours is an 8ft stock tank that is 2ft deep. We can fit 2 floats in there. The floats don't really move around unless there is only one in the water. We have had at least 8 adults sitting in the pool, but we usually only have 2-4 at a time. With our stock tank pool bench we can fit 16+ people either dangling their feet in the water or sitting in the pool. I mean that would be a little excessive but we could do it. If we didn't answer a question you have, please feel free to ask us below! Looks fantastic with your new patio floor finish!! Since they aren't very large, does the water get too warm on hot summer days? For the most part our water doesn't get too warm. If it's ever uncomfortable we will just add a little water from the hose. If your pool sits in the sun all day, this might be a bigger problem for you. But a bag of ice or new water from the hose will usually do the trick! Since using the flex seal how has that held up under water and with chlorine?